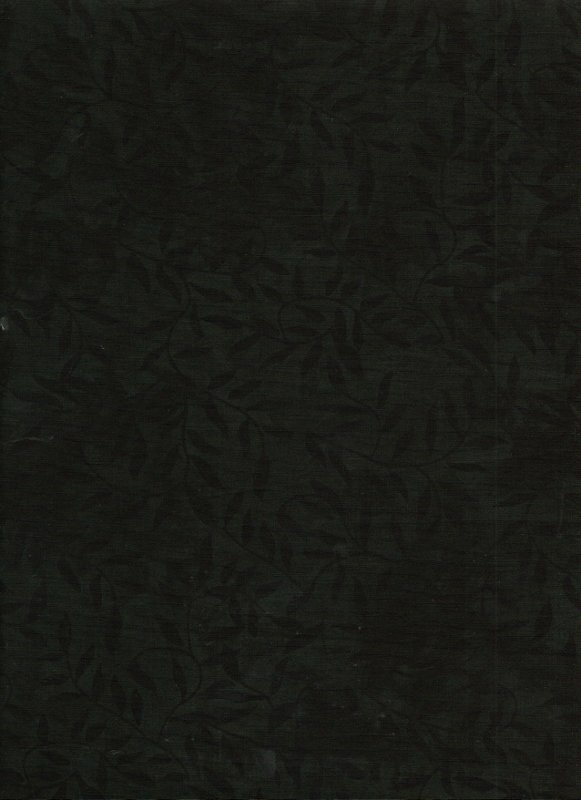 This is a fabulous black blender that adds depth and texture to any project with its deep black vines trailing across a slightly lighter black background. 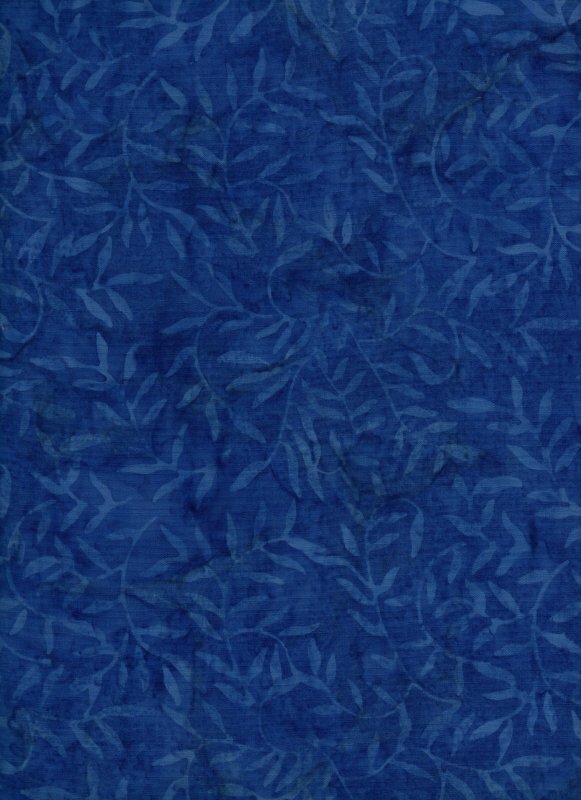 Beautiful medium-blue leafy vine print on a cobalt blue background. 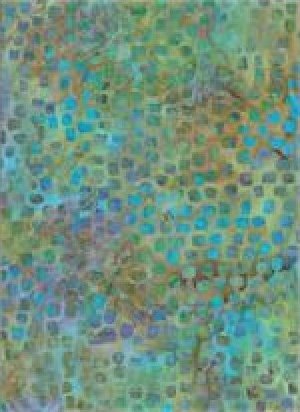 Wonderful blue tone-on-tone batik. 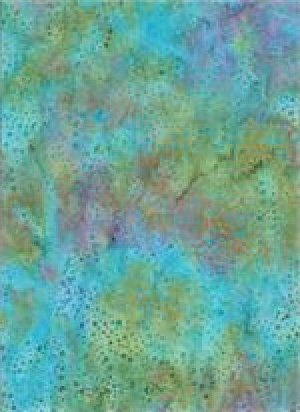 Blue/green/purple hand dye batik with scattered small dots. Super blender that reads as aqua! 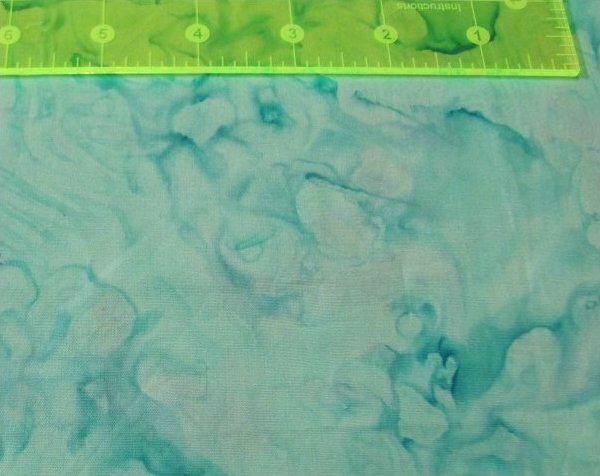 Blue/green/purple hand dye batik with tossed green squares -- another great blender that reads as aqua! 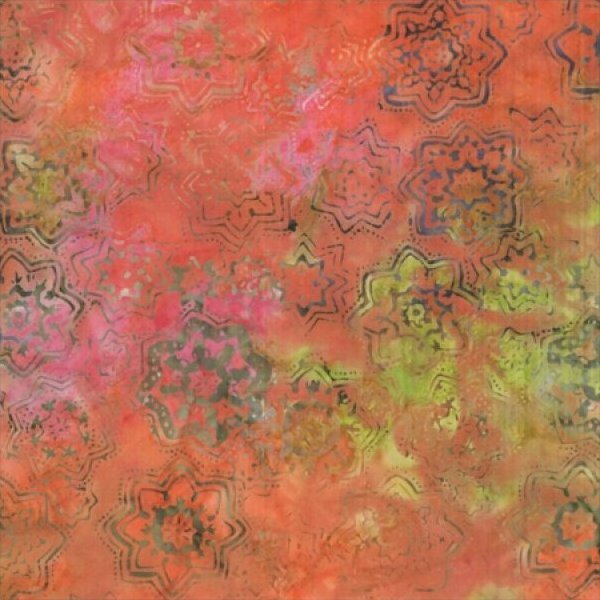 Warm fuscia/orange/lime mottled background batik with woodblock style flowers. 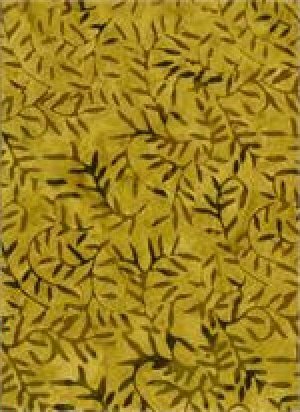 This bright canary yellow hand dye from Batik Textiles just sings summer! 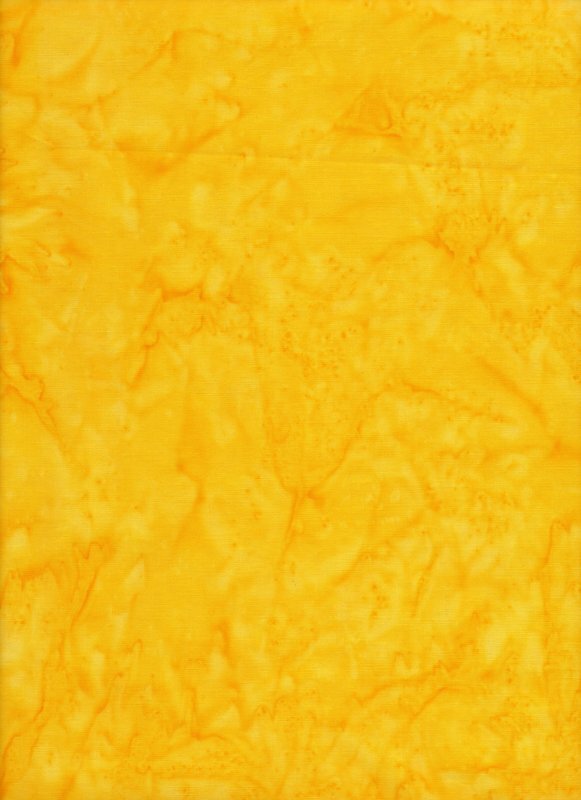 Possibly the purest, brightest yellow we've seen in a batik. 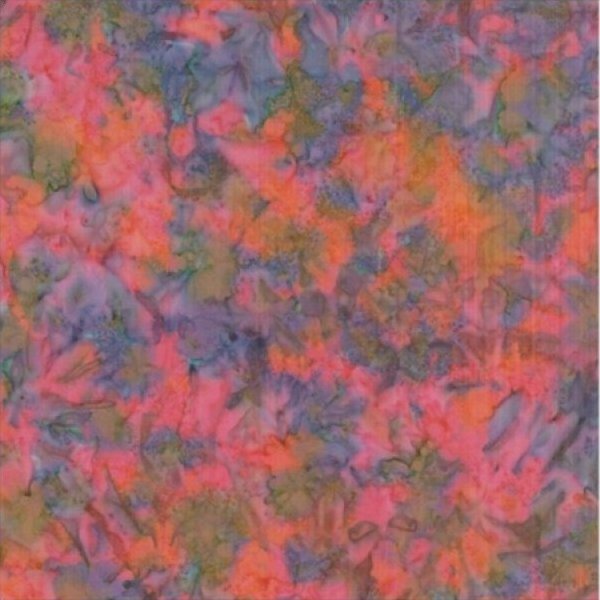 Deep fuscia hand dye batik w/purples, rusts, and some touches of green. Think "giant jawbreaker of indeterminate flavor", or a snow cone with a squirt of every flavor. 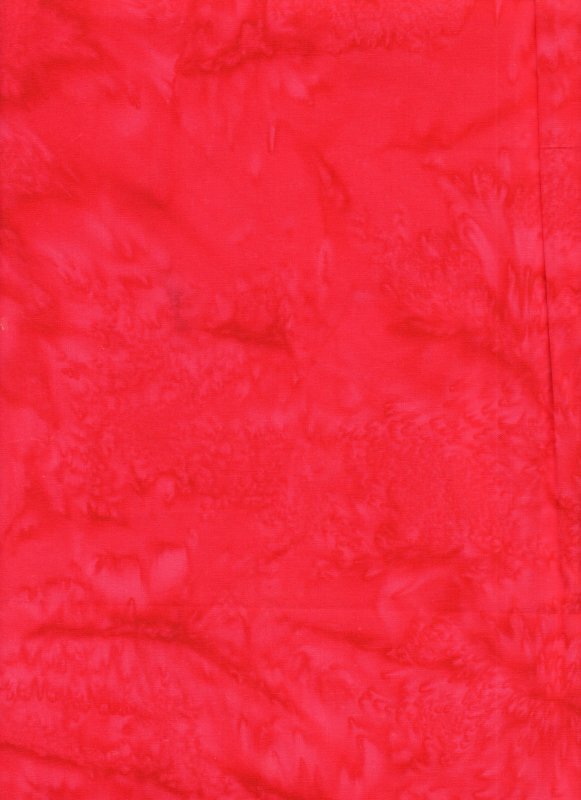 Candy apple red hand dyed batik - rich, velvety tonal you will just love! 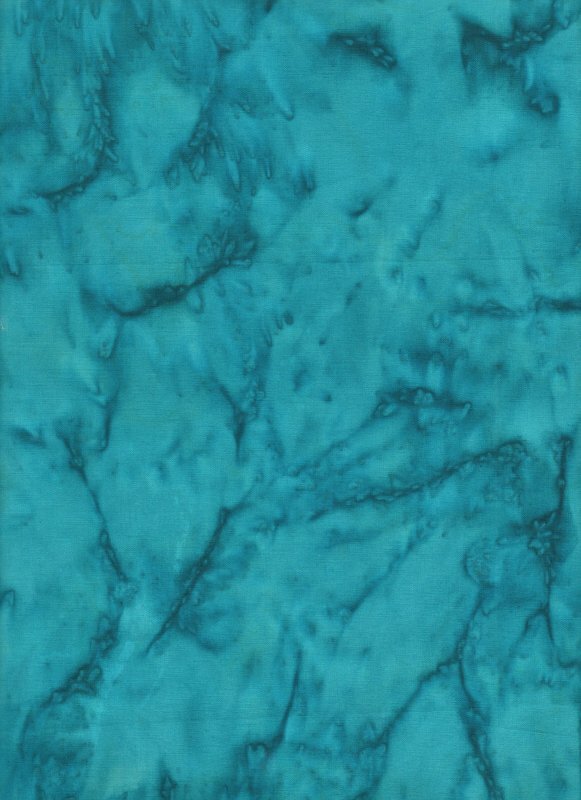 Beautiful Carribean-blue hand dye batik -- a Robin's egg blue with touches of turquoise, sky blue and occasional hits of pale lilac; reads as turquoise. 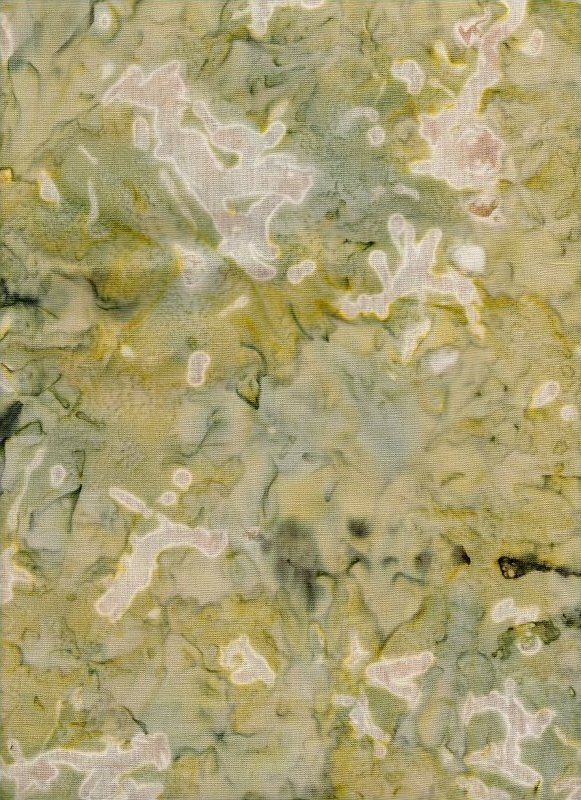 This wonderful background batik has interesting stone-colored "blurred hieroglyphics" on a tonal background of celery and sage. 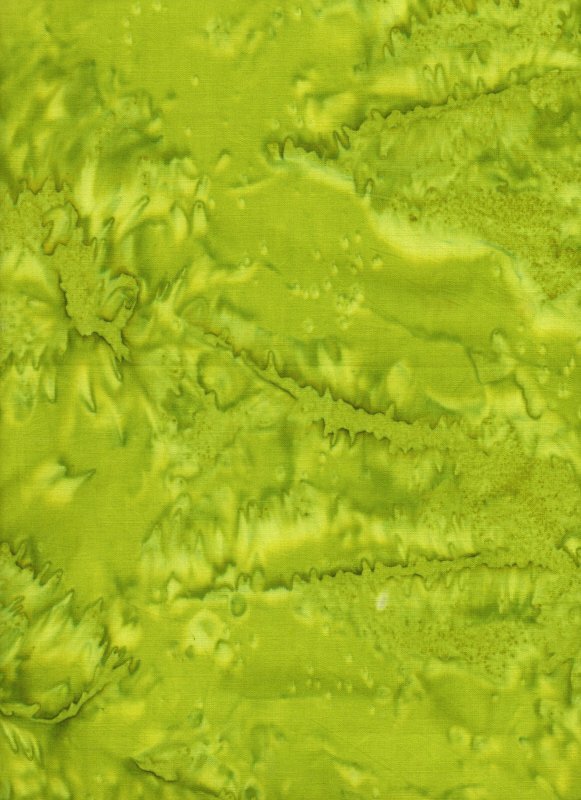 If you like greens, this chartreuse hand dyed batik will just light up your world! 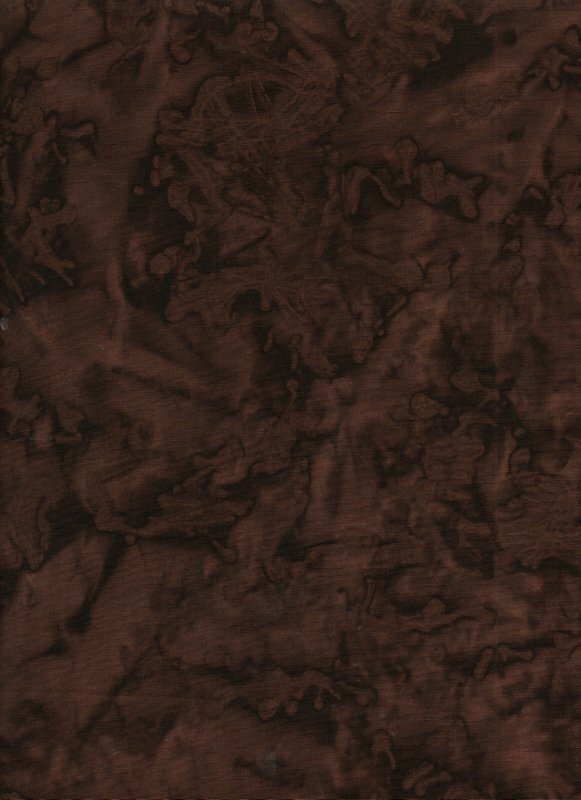 This is another fantastic chocolate tonal batik from Batik Textiles. It reminds us of melted chocolate onto which cocoa powder has been sprinkled and then swirled. 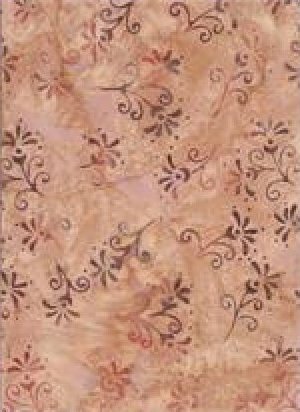 Gorgeous chocolate brown leafy vines cover a cocoa & chocolate mottled background on this luscious batik. 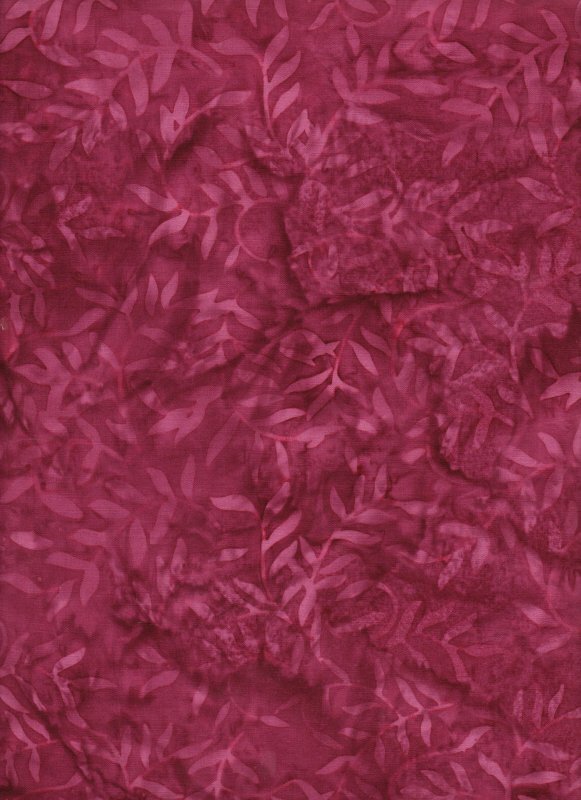 Lovely cranberry leafy vines on a cranberry mottled background makes this gorgeous tone-on-tone blender from Batik Textiles. 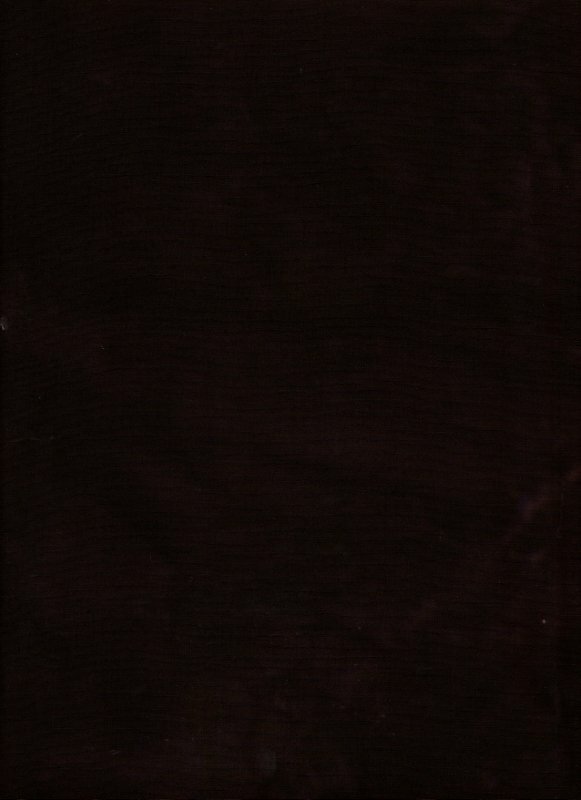 This is a rich, luxurious chocolate brown with touches of cocoa here and there. It reminds us of melted chocolate just waiting for someone to dip strawberries. 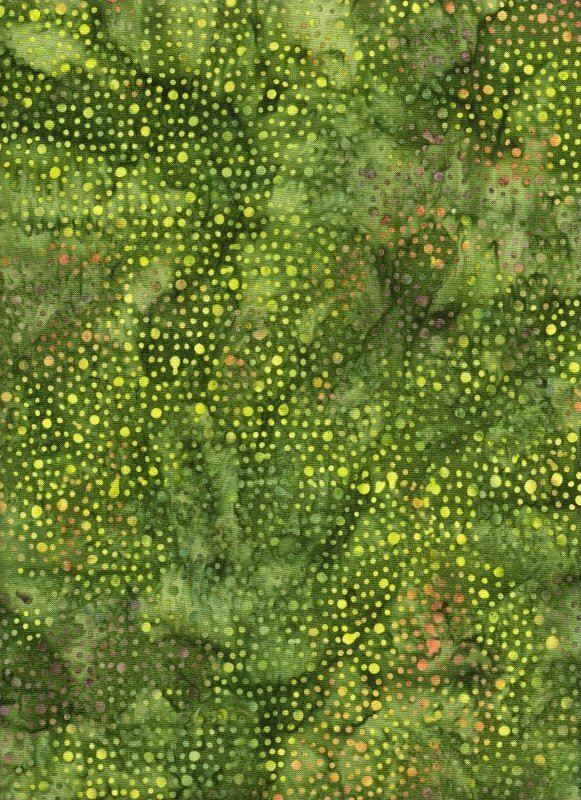 Deep spruce tone on tone batik leafy vines in a medium spruce on a deep spruce/forest green background. Velvety deep teal hand dyed batik - such a deep, rich peacock color you can't help but reach out to feel it! 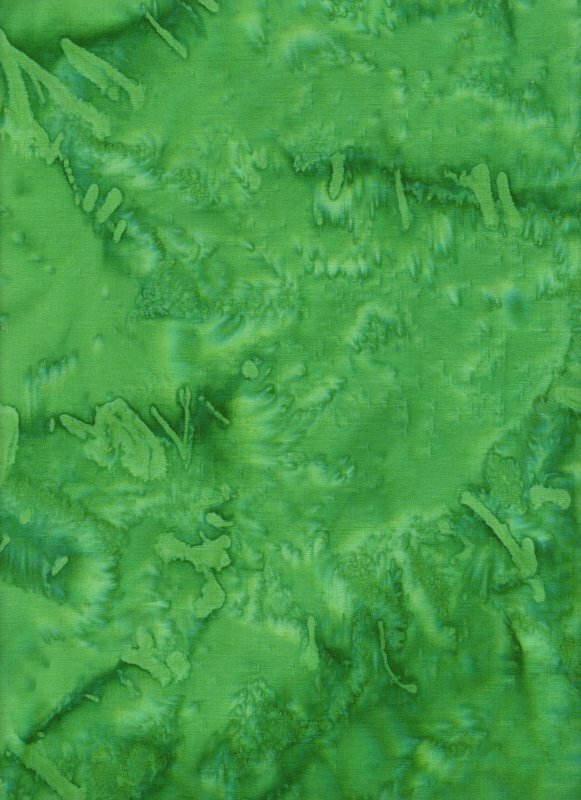 Gorgeous emerald green hand dyed batik blender with a soft hand and rich, velvety appearance. 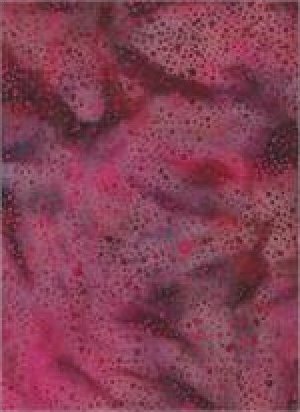 Mottled magenta/fuscia/purple background batik with small hot pink dots. 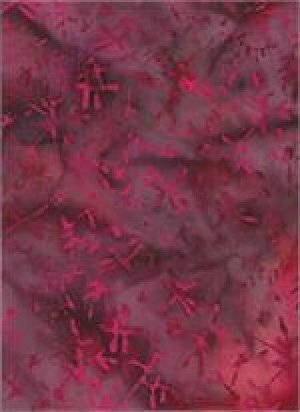 Beautiful mottled magenta/fuscia/purple batik background with tossed wood-block hot pink dragonflies. 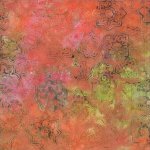 Medium mottled golden brown batik background with brown & purplish trailing vines. 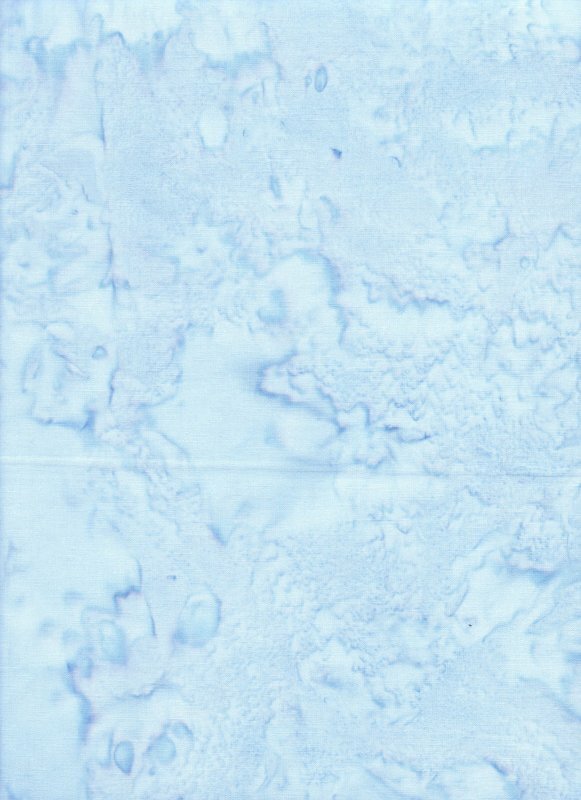 Subtle grayish-blue hand dye batik with hints of turquoise and pale violet. The Shipping Department declared "this looks like a frog!" when we first opened this bolt, so we're calling it "Green Frog". 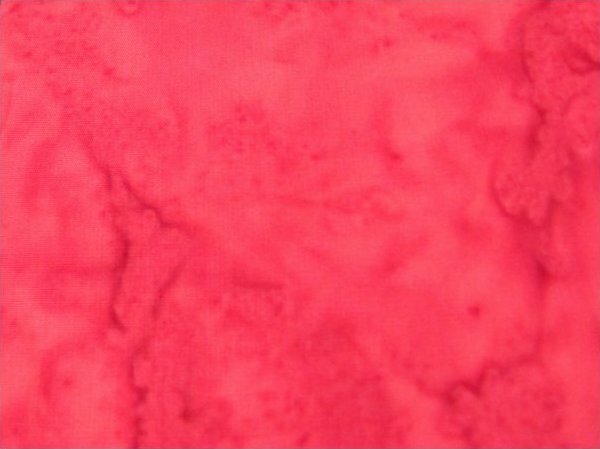 Beautiful hot-pink/fuscia hand dye batik -- great blender and accent color. 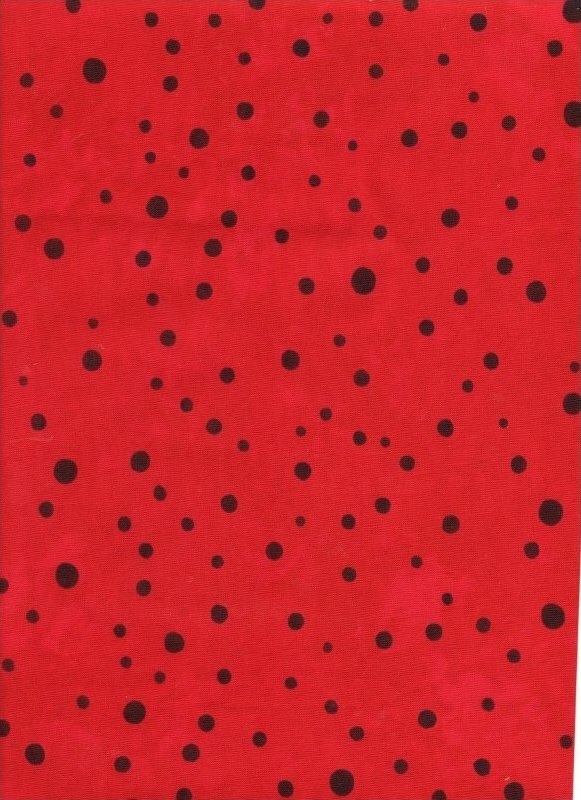 Doesn't every quilt need a touch of fuscia? We think so! 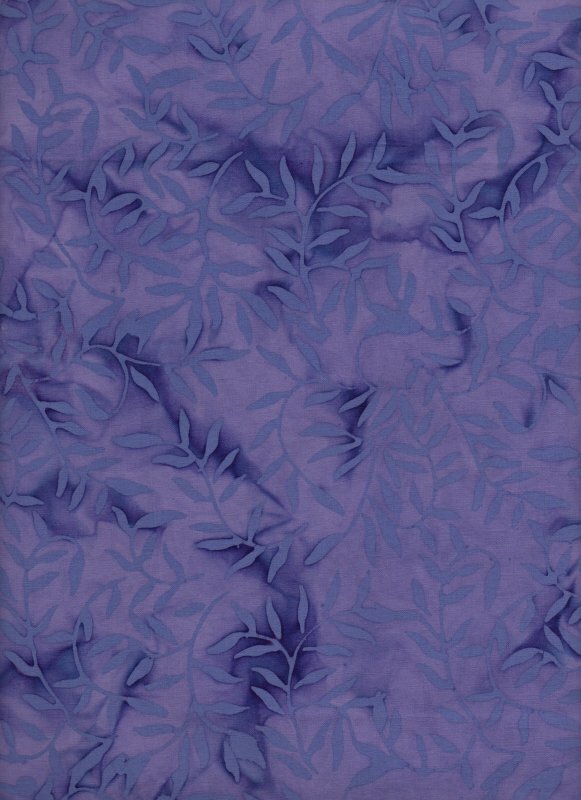 This beautiful violet tonal features periwinkle vines on a violet to purple mottled background. Fantastic blender! 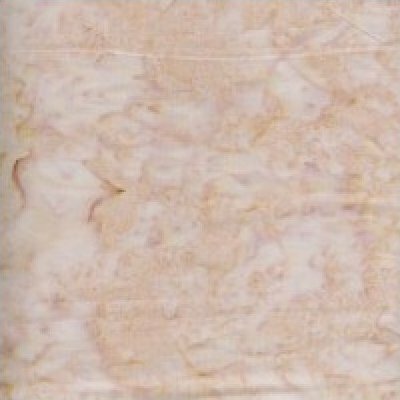 Light brown/beige hand dye batik with hints of mauve and purple. 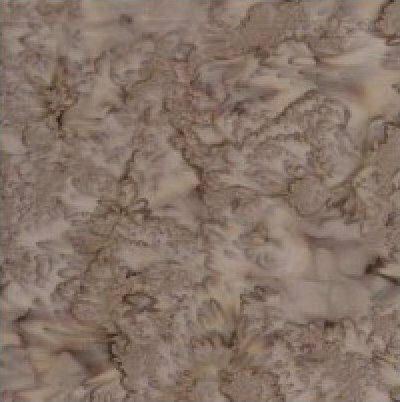 Soft medium beige mottled batik background with tossed wood block flowers. 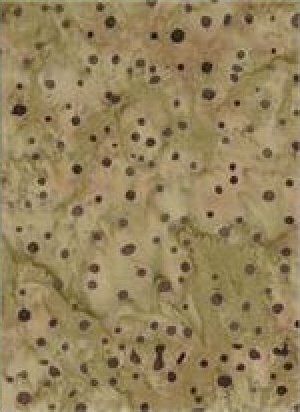 Medium brown mottled background with dark brown/purplish dots. 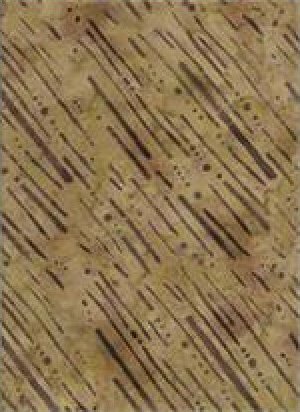 Medium brown mottled background w/diagonal dark brown stripes/dots -- reminiscent of rain sliding down a window. 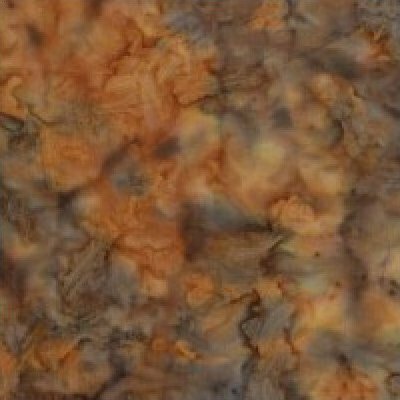 Mottled goldish-brown hand dye with purplish splatches. 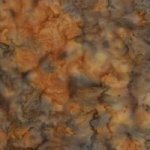 Wonderful autumn-like blender! 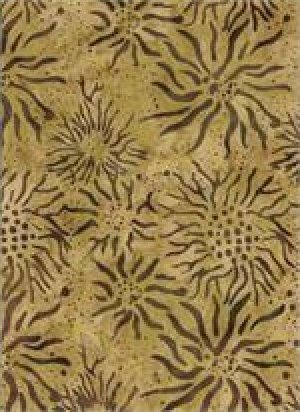 Mottled medium brown background batik with dark brown spider mums. 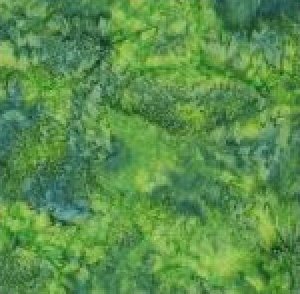 Beautiful emerald green hand dye batik with hints of blue. 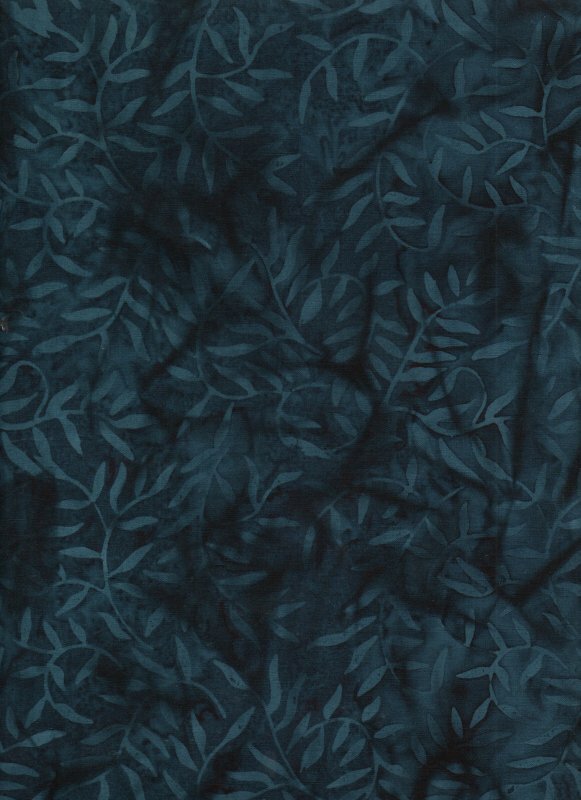 This gorgeous deep navy blue batik has light navy vines tossed across the surface. This dark blue is very hard to find! 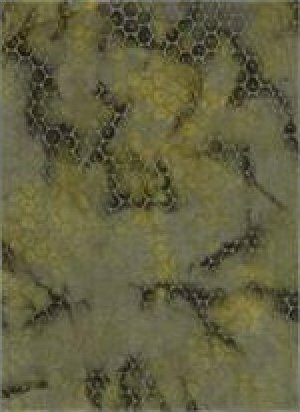 Unique olive/purple/gray mottled background batik with overlying honeycomb print -- beautiful! 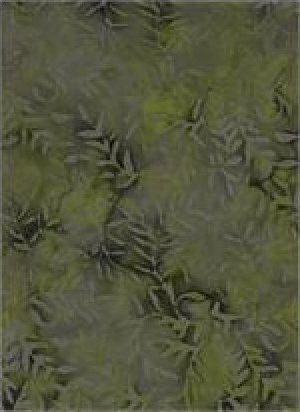 Olive/purple/gray mottled background batik with green and purple trailing vines - simply gorgeous! 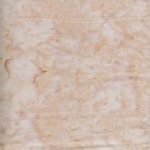 Pale beige hand dye batik -- super background fabric! 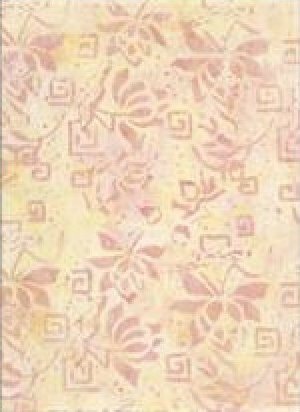 Pale yellow hand dye batik with tossed wood block beige flowers. Gorgeous light batik that reads as pale beige. 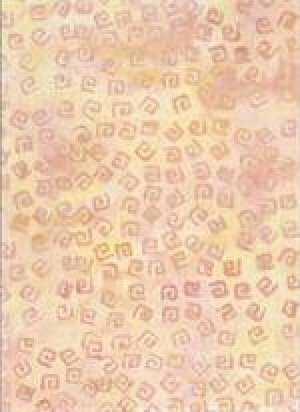 Pale yellow hand dye batik with tossed beige greek-key styled squares. 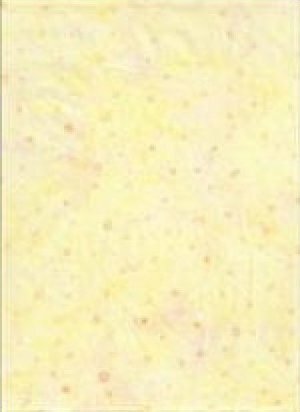 This is a lovely light-colored batik that reads as light beige. 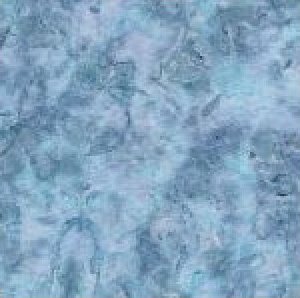 I don't know what it is about this Periwinkle hand dye batik, but it just takes my breath away every time I see it! 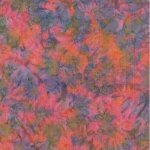 Gorgeous light blender from Batik Textiles. 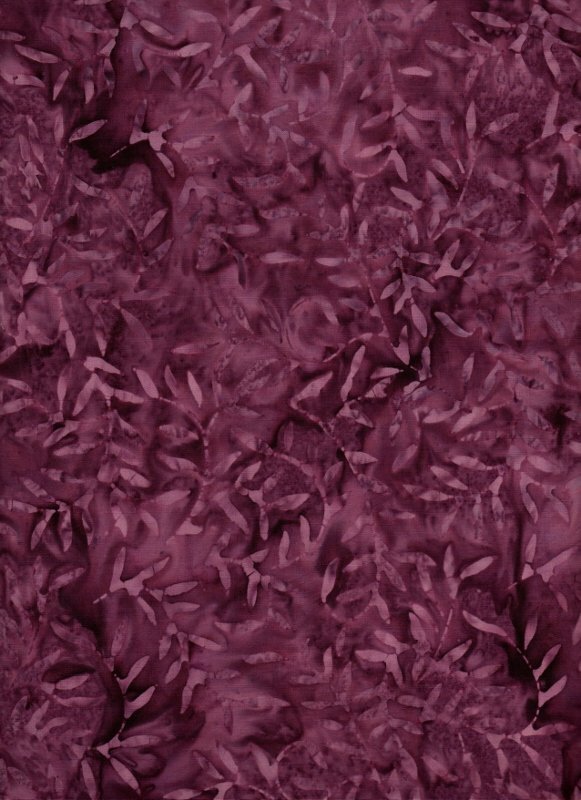 Beautiful plum tone-on-tone features winding vines of nearly mauve on a plum tonal background. 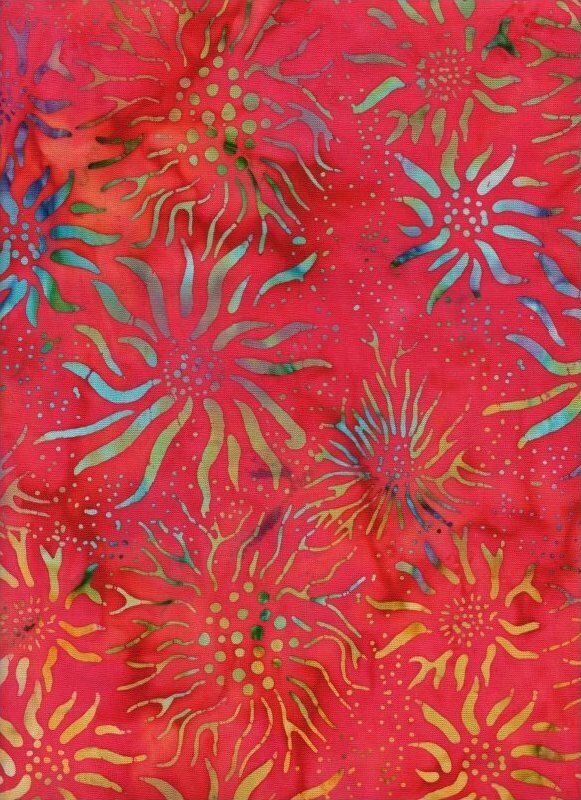 This great design from Batik Textiles has bright, multi-colored spider mums scattered across a background that varies from tomato to candy apple red. 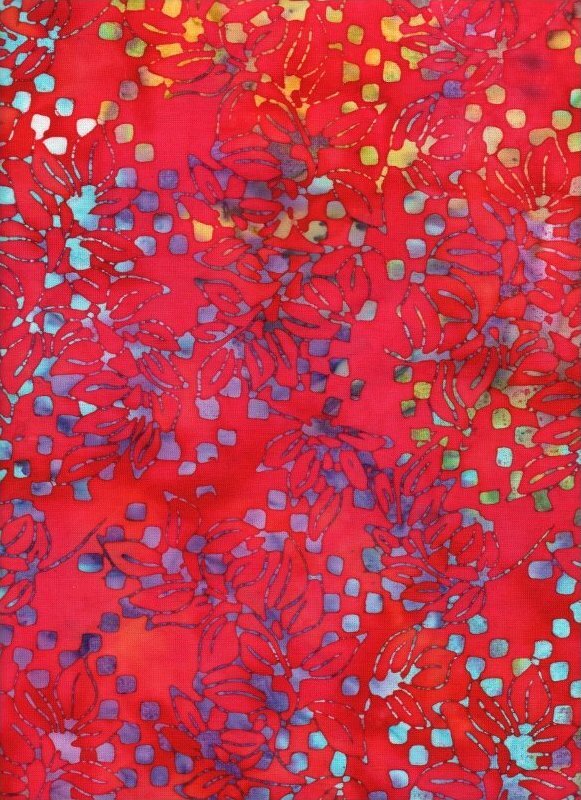 This wonderful red from Batik Textiles varies from a tomato red to deep candy apple red background, with multi-colored abstract vines printed all over it. 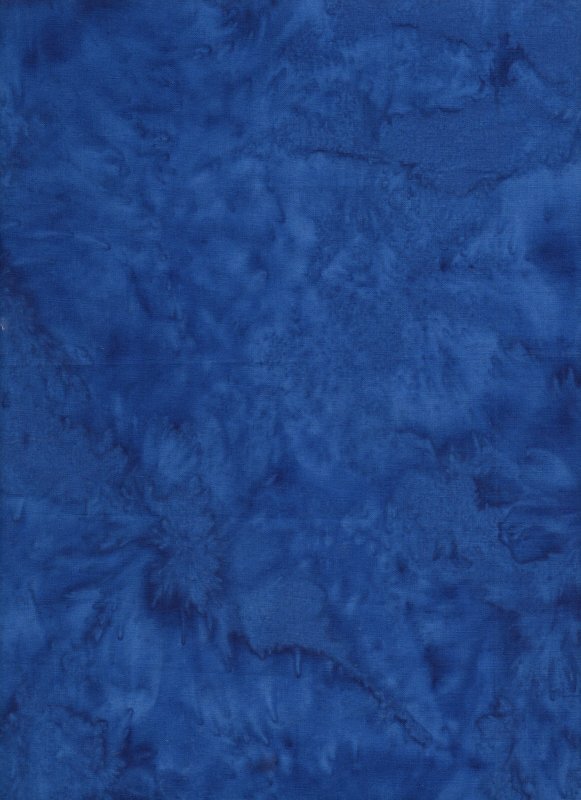 Gorgeous royal blue hand dyed batik - gorgeous, rich blue that looks almost like velvet! 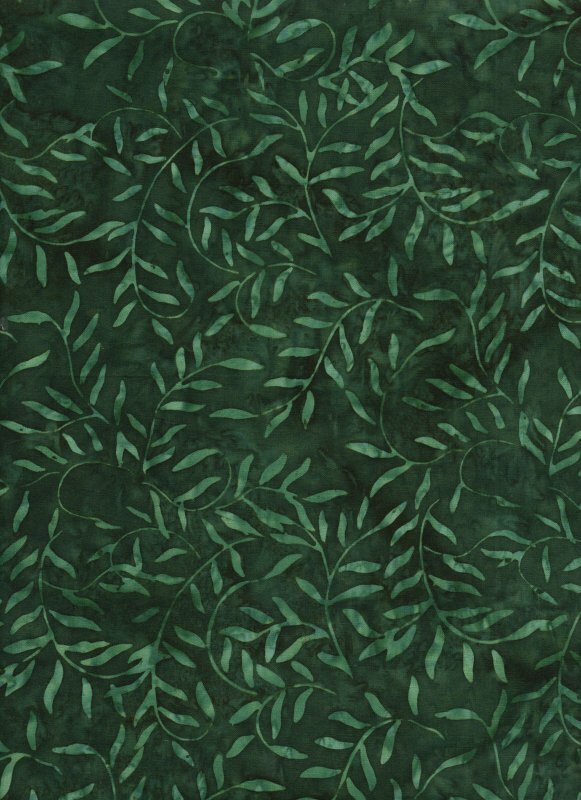 Exquisite emerald green sunprint with tone-on-tone leaves. 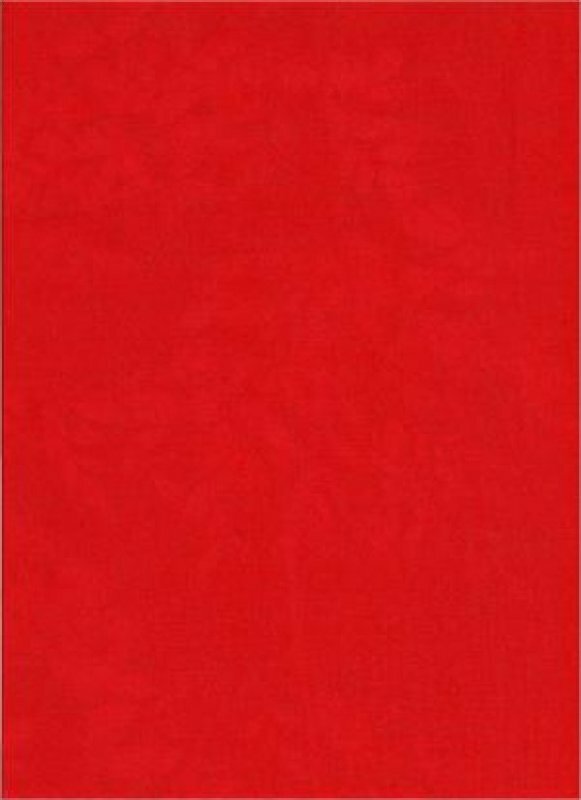 This fabric has a luxurious hand and is much deeper in color than depicted in this photograph. 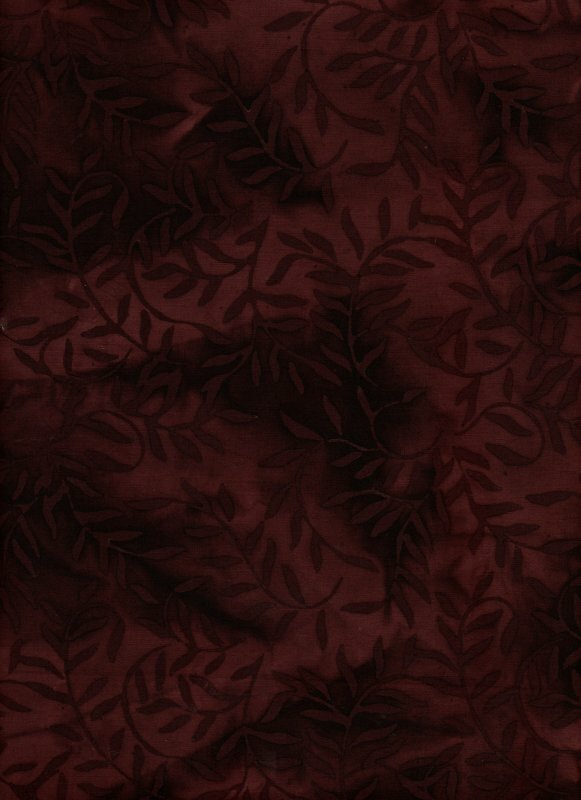 Luxurious red tone-on-tone sun print that features a leaf print on a mottled clear red background. 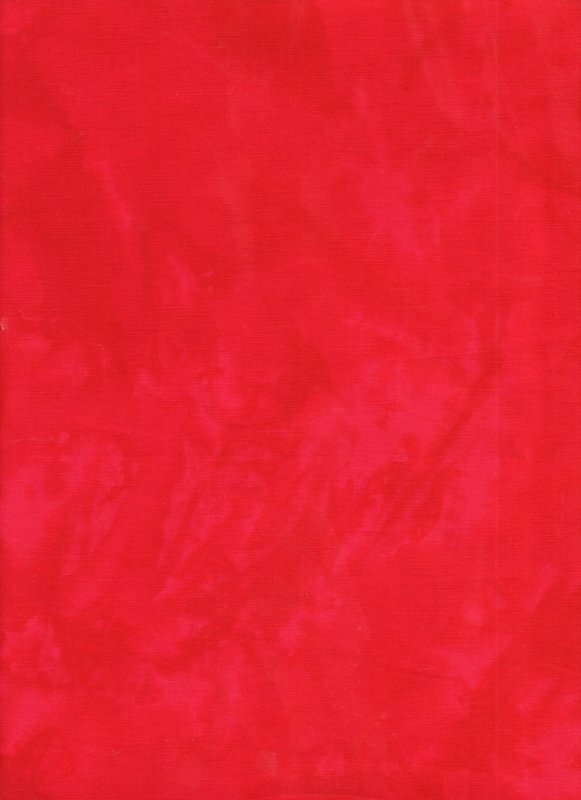 Gorgeous tomato red hand dyed batik from Batik Textiles - fantastic, rich blender!